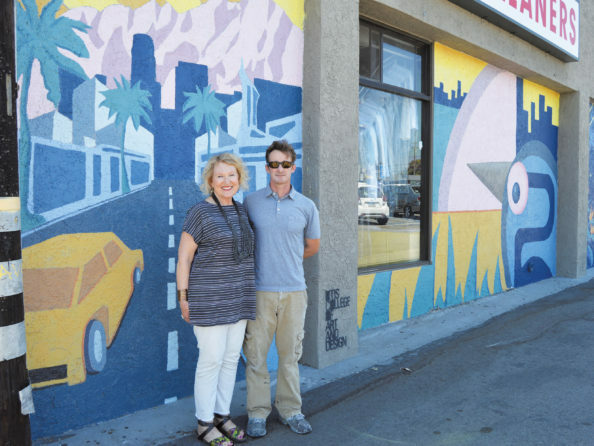 Otis instructor, David Russell, in a collaboration with Karen Dial of Drollinger Properties, is busy transforming the Westchester Business District with colorful murals that pay homage to the community. Russell, who painted the 5-story mural on the Drollinger Office Building (located on the north west corner of Sepulveda and Westchester Parkway), recently completed a new mural on the wall of Spring Cleaners. The mural, which is located facing the parking lot at 8636 S. Sepulveda Blvd., features three panels. According to Russell, the first panel represents a day scene of Sepulveda, with the Loyola Theater and the San Gabriel Mountains in the background. The two lanes of cars represent Sepulveda as a busy thoroughfare in and out of LAX. The middle panel features an abstract bird negotiating its natural habitat, as the city continues to expand. For the last panel picturing Sepulveda at night, Russell gave a nod to Westchester High School and Spring Cleaners’ owner, Issa Gharibeh, an alumni of the school.Comets are the school’s mascot and a sign-post marking Sepulveda and “61st” is a tribute to Gharibeh’s high school football number. He was on the team in 1988 when Westchester High had its only championship season. The mural was completed with help from students from Russell’s Murals and Civic Engagement in the Public Realm class, which he teaches at Otis. Photo caption: Otis Instructor and mural artist, David Russell, poses in front of his latest creation with Drollinger Properties President, Karen Dial. The two have teamed up to bring more art to Westchester.